Eaves, the area where water is shed off the roof slope, can be a problem if roofing materials and accessories are not properly installed. Many times however, the proper installation of roofing materials and accessories is thwarted because the substrate materials are not properly installed. 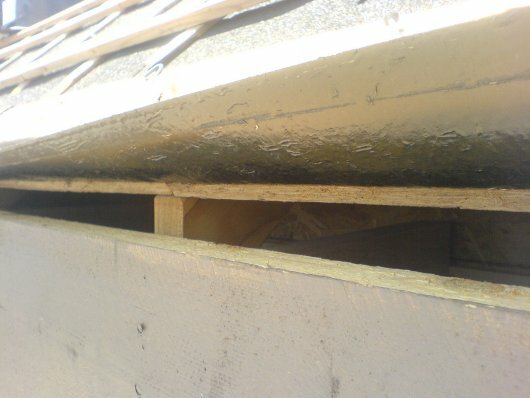 The fascia board is sometimes installed below the top of the roof trusses or rafters resulting in a gap. Other times it extends up past the surface of the roof decking creating a standing water situation (water ponding). 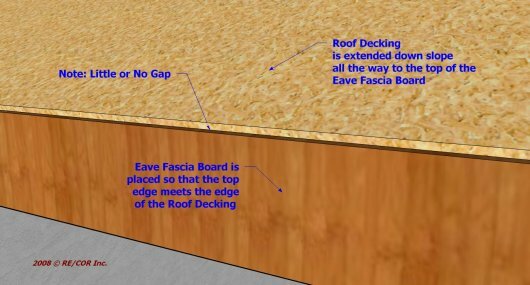 Sometimes the decking of the roof does not extend to the top of the fascia board creating a gap at the eave. 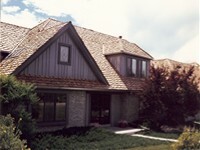 Sometimes both the fascia and the decking for the roof are not properly installed creating even a larger gap at the eave. Roof Decking is not extended down the slope to the top of the eave fascia board leaving a large gap. 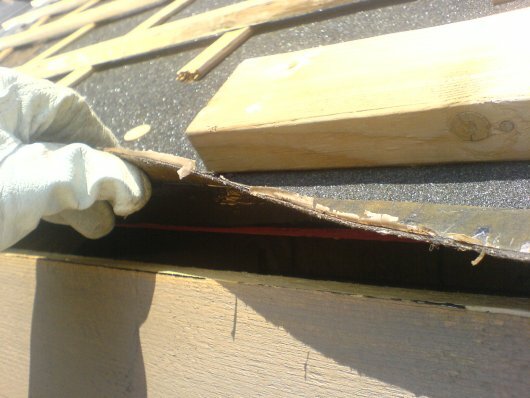 The eave fascia board is too low leaving a large gap. This lack of proper construction techniques by the builders cause headaches for roofing contractors. When observed, inform the builder's supervisor so they can rectify the situation. 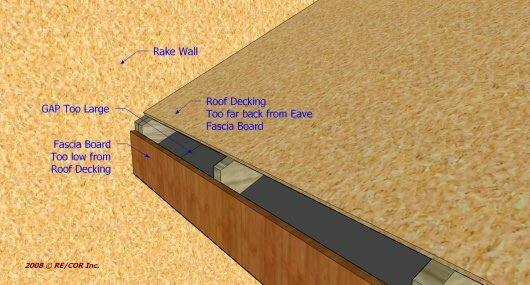 The above sketch shows what the intersection of the roof decking and the fascia board should look like at all eaves. No or a very small gap. The gap must be kept at a minimum for the proper installation and nailing of the metal drip edge, asphalt shingle starter, the first horizontal batten and hurricane clips for tile roofs, etc. These materials and others that might be used at the eves must be nailed into the decking not thin air. In addition, the larger the gap is at the eave the more snow will have a chance to blow up under the metal edge into the soffit area. Remember, most City/County Building Inspectors are interested in having the structures built properly. Talk to them if the builder will not solve the problem. Once you go ahead with your work and cover over someone else's mistakes, you may have just bought the whole mess.